As out trip in Wales continued, we were heading from our hotel near Caldicot, to meet with Justine’s family a little further north and west. Before we did that, Justine wanted to see Tintern Abbey, ruins of an old Abbey that I had visited on a previous trip. We woke at a pretty reasonable hour, and had a relaxing start to our morning. We had breakfast in the restaurant (they do a great British breakfast), and then got packed up to go. Justine’s family was about an hour away, and we had suggested that we would meet them a little after lunch time. We didn’t have a lot of time, but Justine wanted to go up to Tintern Abbey, a place I had visited on my last trip to the area. It’s utterly spectacular, so I didn’t mind going back. A first view from inside. The drive up to the abbey was about 15-20 minutes, along twisty, curvy roads. In places it was reduced to a single lane with traffic lights to control traffic - not that there was much. Justine was as impressed as I suspected she would be, and we decided to go inside and check it out. That was different from last time - I did not have the time to go inside. A full view of the outside of the ruins. Tintern Abbey was founded on 9 May 1131 by Walter de Clare, Lord of Chepstow. It is situated adjacent to the village of Tintern in Monmouthshire, on the Welsh bank of the River Wye, which at this location forms the border between Monmouthshire in Wales and Gloucestershire in England. It was the first Cistercian foundation in Wales, and only the second in Britain (after Waverley Abbey). The abbey fell into ruin after the Dissolution of the Monasteries in the 16th century. The present-day remains of Tintern are a mixture of building works covering a 400-year period between 1131 and 1536. Very little of the first buildings still survive today; a few sections of walling are incorporated into later buildings and the two recessed cupboards for books on the east of the cloisters are from this period. The church of that time was smaller than the present building, and slightly to the north. The Abbey was mostly rebuilt during the 13th century, starting with the cloisters and domestic ranges, and finally the great church between 1269 and 1301. The first mass in the rebuilt presbytery was recorded to have taken place in 1288, and the building was consecrated in 1301, although building work continued for several decades. Roger Bigod, 5th Earl of Norfolk, the then lord of Chepstow, was a generous benefactor; his monumental undertaking was the rebuilding of the church. The earl's coat of arms was included in the glasswork of the Abbey's east window in recognition of his contribution. Inside the Abbey - this might be my favourite shot from the visit. Some of the decorative stone work. It is this great Decorated Gothic abbey church that can be seen today, representing the architectural developments of its period; it has a cruciform plan with an aisled nave, two chapels in each transept, and a square-ended aisled chancel. The abbey is built of Old Red Sandstone, with colours varying from purple to buff and grey. Its total length from east to west is 228 feet, while the transept is 150 feet in length. In the reign of King Henry VIII, his Dissolution of the Monasteries ended monastic life in England, Wales and Ireland. 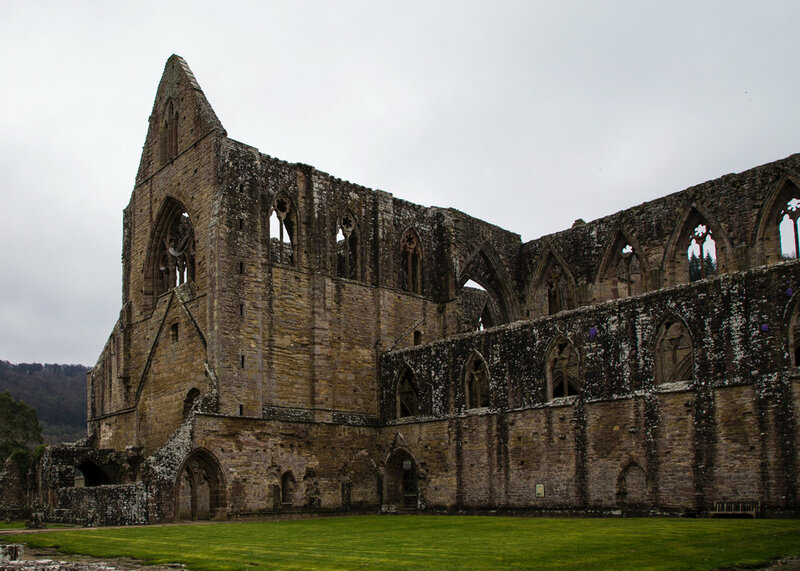 On 3 September 1536, Abbot Wych surrendered Tintern Abbey and all its estates to the King's visitors and ended a way of life that had lasted 400 years. Valuables from the Abbey were sent to the royal Treasury and Abbot Wych was pensioned off. The building was granted to the then lord of Chepstow, Henry Somerset, 2nd Earl of Worcester. Lead from the roof was sold and the decay of the buildings began. Justine, for a sense of scale. The place is huge - it’s amazing to think of the conditions and (lack of) technology when they built it. We spent a good couple of hours looking through the site. It really is an amazing place, and a shame that it ended up in ruins. You can only try and imagine what it must have been like when it was intact. Pano of the complete site. Another shot that I think worked out quite well. As you probably noticed, this tree captured my imagination a number of times. The front facade of the Abbey. One more pano of the site. Not the same tree, but another cool view. After poking around the Abbey, we headed off to meeting Justine’s family. The live in a small town called Tylorstown, which is close to Pontypridd (closest large town), about 30-45 minutes northwest of Cardiff. It took us about 2 hours to make our way there (with some navigational issues, but eventually we made it. The area has a very significant coal mining history, and Justine’s family were involved in that in the past. Over the next few days we were exposed to that, and a lot of other cool things. Thursday night I got an introduction to the whole extended family, which was a lot of fun! Our day on Thursday wasn’t quite complete, but I’ll cover that off in the next post.